Explanation: Today Comet Wirtanen passes by the Earth. The kilometer-sized dirty snowball orbits the Sun every 5.4 years, ranging as far out as Jupiter and as close in as the Earth. Today Comet 46P/Wirtanen passes within only 31 lunar distances to the Earth, the closest approach in 70 years. If you know where to look (Taurus), you can see the comet through binoculars as an unusual blue smudge. 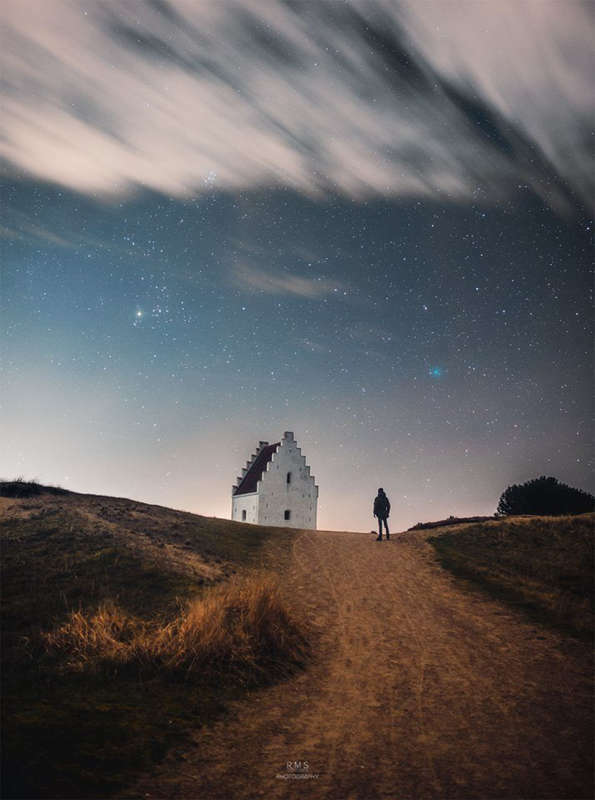 Pictured a week ago, Comet Wirtanen was photographed in the sky beyond an old abandoned church in Skagen, Denmark. The image composite also captures the astrophotographer. After today, the comet will begin to fade as it recedes from the Earth and the Sun.